You already know that a trip to Rome is not complete without a visit to the famous country within the city, Vatican City. But, there are so many different tour options, how do you choose? It all depends on how much time you have, the time of day and how in-depth you’d like your tour to be. All of our Vatican tours include skip the line tickets, local English-speaking guides, a tour of the Vatican Museums and a visit to the Sistine Chapel. 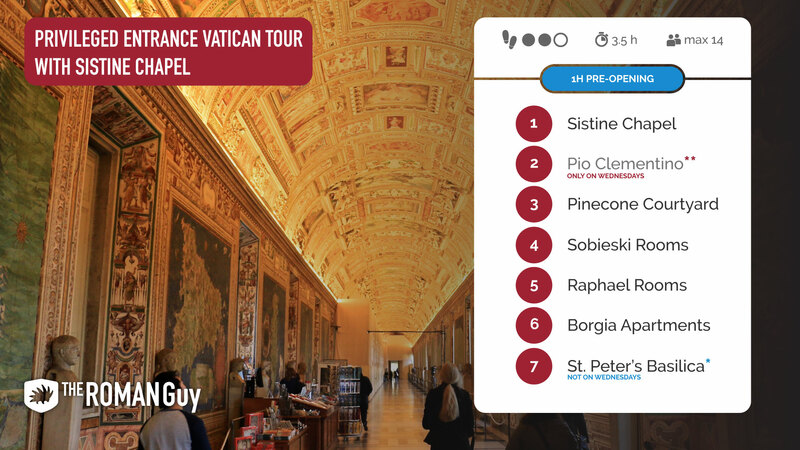 In this guide, you’ll discover our best Vatican tours and be able to discover which one’s right for you. We want your time in Rome to be a memorable experience. Whether you are visiting for a shorter or longer period of time, we offer the best Vatican tours for your needs. 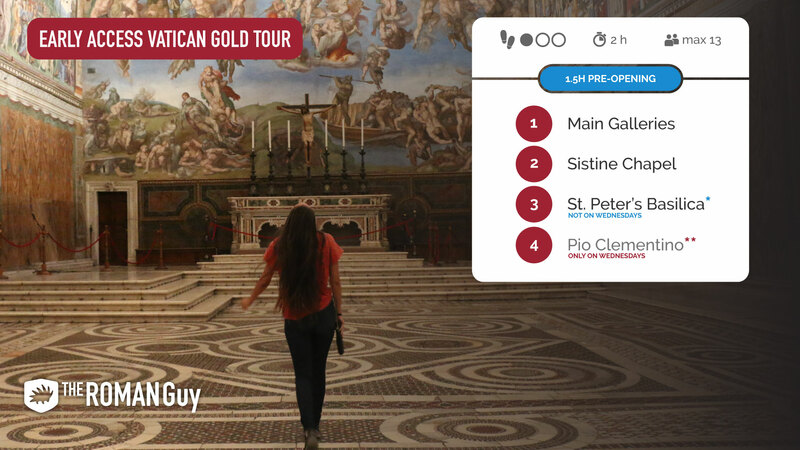 From evening Vatican tours to the earliest skip the line Vatican Gold Tour, we have you covered. 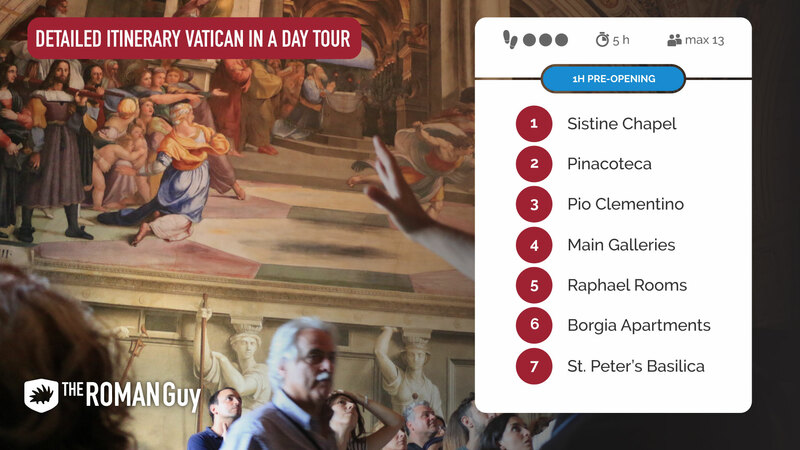 WHICH IS THE BEST VATICAN TOUR FOR YOU? Our Super Early Vatican Gold tour offers a unique and exclusive experience in the Vatican Museums, Sistine Chapel and St. Peter’s Basilica. Enter an entire hour and a half before the general public at 7:30 am and witness the Sistine Chapel in complete serenity with no crowds. 7:30a.m. start for entry shortly after 8a.m. Skip the line entrance to St. Peter’s Basilica (except on Wednesdays). Are you visiting Rome on a Saturday during the spring or summer months? 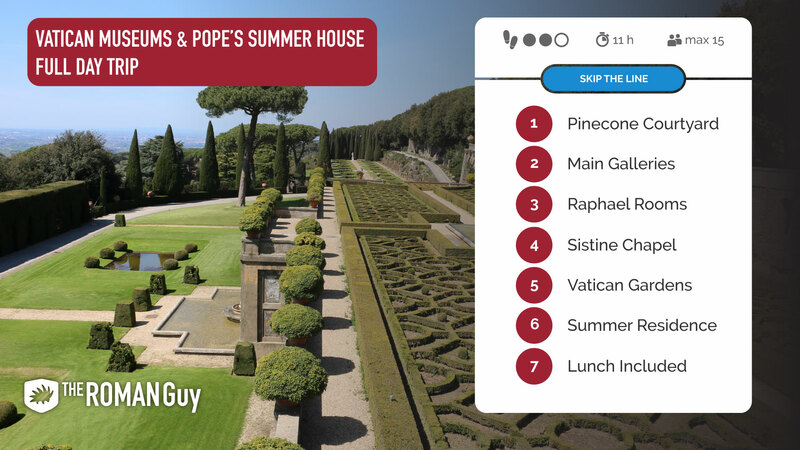 Why not make a whole day of it with our Vatican Museums and Pope’s Summer House Full Day Trip? With this experience, you will take a guided tour of the Vatican Museums, Sistine Chapel, Vatican Gardens and a day trip by train to the Pope’s Summer residence. A return train ticket and delicious lunch fit for a pope are included! Exclusive stroll through the Vatican Gardens. Train ride from Stazione di Città del Vaticano to Castel Gandolfo. Buffet lunch fit for a Pope. Free time to explore the town of Castel Gandolfo. 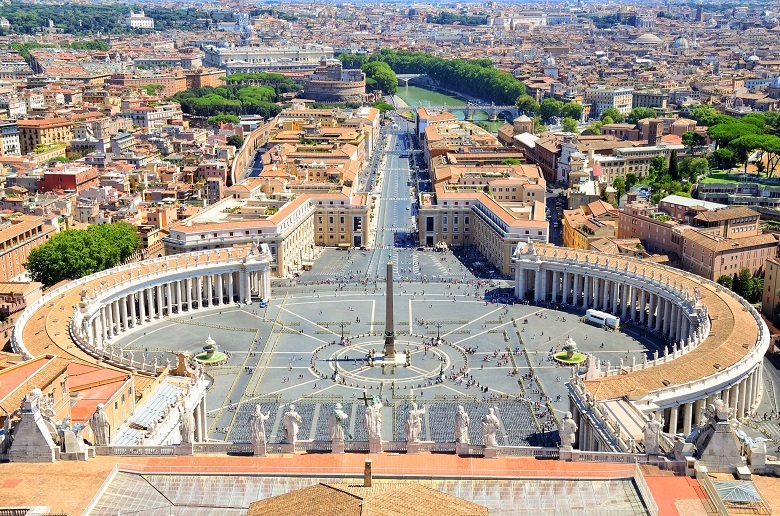 Rome is full of must-see sites, and the Vatican should definitely be at the top of your list. If you are looking to see all that Rome has to offer in a short amount of time, then this Vatican Highlights Tour is the one for you. You’ll see the main highlights of the Vatican Museum’s best galleries, Michelangelo’s masterpieces in the must-see Sistine Chapel and tour St. Peter’s Basilica all with an expert guide in just two and a half hours leaving you with plenty of time to climb St. Peter’s Dome. After making the trek to the top, be sure to reward yourself with a delicious lunch and a gelato or two. You may even have time for an afternoon Colosseum tour. Want to see the beauty of Michelangelo’s masterpiece that is the Sistine Chapel but don’t want to be crammed in like a can of sardines? Boy, do I have the best Vatican tour for you! 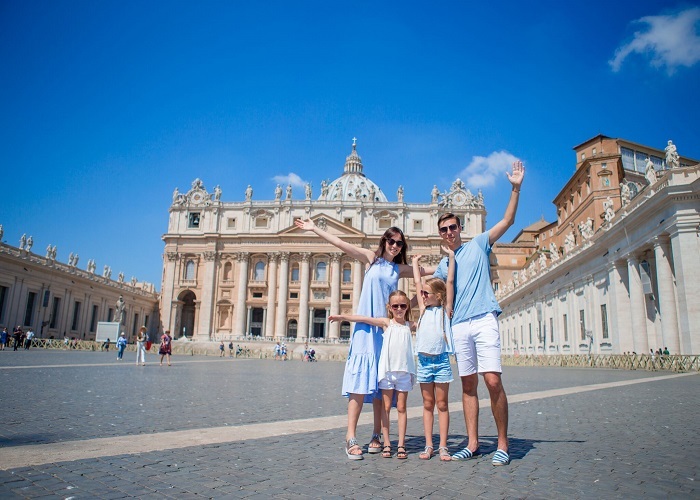 Start your day off bright and early with our 3.5-hour Privileged Entrance Vatican Tour with Sistine Chapel which enters the Vatican a full hour before the general public and heads straight for the Sistine Chapel. By starting the tour here, you’ll get to marvel at Michelangelo’s masterpiece with limited crowds. Is there a better way to start your day? 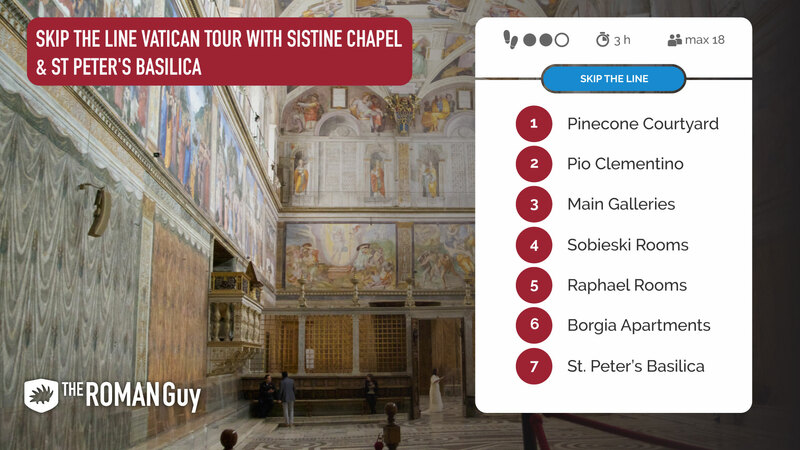 If you don’t have time for an early morning tour or would prefer to visit in the afternoon, then our Skip the Line Vatican Tour with Sistine Chapel and St. Peter’s Basilica is the tour for you. With multiple start times throughout the day and skip the line tickets, you’ll find a time that’s just right for you. Are you an art and history lover looking to immerse yourself in the beauty of the Vatican Museum’s art collection? Our five-hour Detailed Itinerary Vatican in a Day Tour with Privileged Entrance is perfect for you! This tour dives deep into the magnificent artworks housed in the Vatican Museums, Michelangelo’s Sistine Chapel and St. Peter’s Basilica. 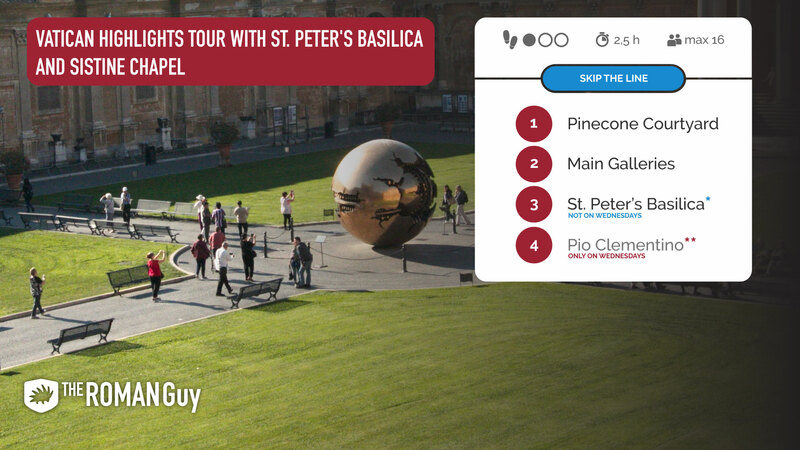 You’ll even get the bonus of a visit to the Pinacoteca, Carriage Pavilion and Bramante Courtyard. The five hours will fly by as you soak up all the beauty and history of the priceless works of art on display. A maximum group size of 12. Perfect for the art lovers of the world. Want to see the Vatican Museums at night? 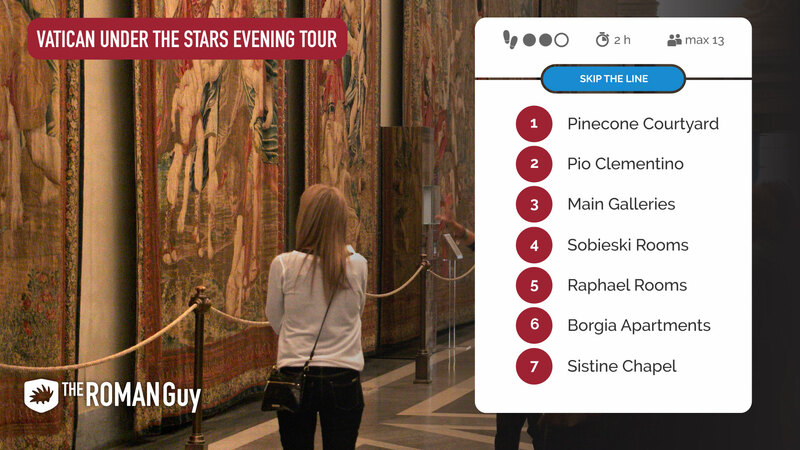 Our Vatican Under the Stars Evening Tour allows you to do just that. With VIP access you’ll be able to admire the beautiful statues, paintings and tapestries without the crowds after the Vatican Museums close to the public. You’ll even have the chance to take great photos of St. Peter’s dome all lit up from a fantastic terrace view. A maximum group size of 13. Visit the museums under the stars and without the crowds. Opportunity to stay inside the Vatican Museums and explore on your own after the tour concludes. Please have your shoulders and knees covered as the Sistine Chapel and St. Peter’s Basilica are sacred places. We understand that this is not as easy in the summer months so we recommend bringing a shawl/sweater to use when necessary. Before saying arrivederci, be sure to ask your guide where they’d recommend grabbing a bite to eat. If you have any concerns at all about your mobility, we recommend taking a private tour to ensure that you have the best experience possible. A first generation immigrant to the U.S., I've enjoyed being in the air since flying over here from the Philippines. I am an avid reader who enjoys reading the works of the Stoics. My travels have brought me all over Italy where I imagine that I would've had some great conversations with Marcus Aurelius.